How long does it take to cook a smore with a pizza box solar cooker? It is about 100*f outside. The box is painted black so it will absorb more energy from sun. How long does a Smore take in a Pizza Box Solar Cooker? That can depend on a variety of factors...such as how well you built your box cooker. Things such as how well insulated it is, or how big your reflective panel surface is. Also the time of the day and whether the sun's rays are diffused by high clouds can have an effect on how long it takes. With solar cooking there can be many variables, but in general and on average you can cook a Smore in about 10-15 minutes, depending on how cooked you want it. 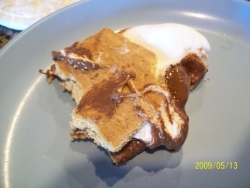 I cooked a smore in a small, $5.00, homemade solar panel cooker in about twenty minutes. It could have been less, but I let it go for twenty to make sure it was nice and gooey.